Ghost is a character you won’t forget because he’s very honest about everything. He messes up, you feel for him. He does something right, you cheer for him. As he explains, he has “scream inside.” Many people would quickly label Ghost a “bad kid” but what Reynolds does so well is remind readers that behind every person, behind every relationship, there’s a story. Usually the “bad kids” have experienced heavy things and could benefit from real, caring relationships. Ghost likes sunflower seeds & world records and takes a lot of crap from kids at school. After his dad tries to shoot him and his mom, the harrowing experience leaves him even more shaken up. He learns to run that night (“…running ain’t nothing I ever had to practice. It’s just something I knew how to do.”) and later earns a spot on a track team without even trying. Tough as nails (not really) “Coach” takes Ghost under his wing and they become closer as Ghost learns more about himself. He leaves it all out on the track; pushing himself to be better, in every way. He becomes more disciplined, he finds community in his team, and though he continues to make stupid mistakes, he grows as a young man. Reynolds does an amazing job of creating voice for this book. Ghost’s AAVE is prominent and used unabashedly, he’s silly and makes interesting connections in his head. I love it; it feels fresh. Reynold’s characters are all very interesting people; he includes little memorable details like…Ghost’s mom hates studying and pretends to study while they watch her favorite love stories. Though this is a slim book, there’s a great amount of character development that’ll keep you interested and excited about the next book in the series. I love Coach!! He’s the father-figure Ghost needs and deserves in his life. Though he’s kind enough to bail Ghost out of sticky situations, he makes sure to teach him important lessons too. It not just about Ghost’s track potential for him; he recognizes early that Ghost needs guidance and love. He comes from the same rough place as Ghost and is committed to shaping him. This entire book is about connections and relationships but Ghost and Coach’s relationship is what shines the most. I really enjoyed this book! I’m curious about how children of color are reading/enjoying it too. This is my first book by Jason Reynolds and I can’t wait to read more. P.S. OMG I reviewed a chapter book (it’s been a while)…lol. Radiant Child is a masterful tribute to artist Jean-Michel Basquiat. Steptoe channels Basquiat’s energy and love for his city in how he uses found-wood pieces from landmarks all over NYC and paints them in rich colors. This is an honest and thoughtful picture book. It introduces Basquiat and his art to children and is exactly what we need in children’s literature, especially for children of color. A confident, smiling black boy on the cover is powerful in and of itself. In Radiant Child, we meet a Haitian/Puerto-Rican boy from 1960s Brooklyn, NY who dreams of becoming an artist. Basquiat is a focused and messy artist and his mother, also a creative person, encourages him to create. His mother leaves home because of her mental health and this leaves him heartbroken…but not broken; he keeps creating and drawing outside of the lines. As he gets older, his drawings become graffiti. He makes sure to stay connected to his mother as best he can; he wants her to see the artist he becomes. His graffiti, under the name “SAMO,” eventually becomes art in galleries and museums. Basquiat’s talent and drive bring him international fame. Steptoe uses powerful and lyrical text (“Somewhere in Brooklyn, between hearts that thump, double Dutch, and hopscotch and salty mouths that slurp sweet ice, a little boy dreams of being a famous artist”) to tell Basquiat’s story. His art is equally compelling; brightly painted & collaged wood blocks are fun to look at. None of Basquiat’s original art is used in this book; it’s all Steptoe’s original work inspired by the artist. As we learn about Basquiat’s life, style and use of symbolism, we can also study the symbolism that Steptoe tucks into his detailed illustrations. The cover alone (Haitian and Puerto Rican flags prominent, ABC blocks that spell out Basquiat’s name, etc. ) tells Basquiat’s story. I love that this book celebrates Basquiat’s relationship with his mother and that it’s honest about mental illness; this is important for children, as many may relate to Basquiat’s life. A lengthy Author’s Note gives readers more information about Basquiat (including information about his drug addiction and death) and tells us why and how Steptoe came to create this book. This vibrant and beautiful book is one of the best of 2016. It will win a Coretta Scott King Award but will it also get a Caldecott? I hope it does; the art is top notch. Nevertheless, I hope many children read Radiant Child because Basquiat’s spirit, creativity and determination to create are inspiring! 2017 is going to need a heaping spoonful of kindness. Kindness and consideration for others. But it’s not just “consideration” that we need, it’s holding people in our hearts. There’s a difference there. A deeper level of connection. In A Hat for Mrs. Goldman, we meet Sophia and Mrs. Goldman who are close friends and neighbors. Mrs. Goldman has cared for and loved Sophia since she was a baby, when she knit her her first hat. Because Mrs. Goldman is so busy knitting for everyone else, she doesn’t have a hat to keep her head warm and Sophia decides to do something about it! Though she only vaguely remembers how to knit (her speciality is making pom-poms), she determinedly works on a special hat for her friend. It turns out a little lumpy but it’s beautiful because it’s a gift for her friend. What I like so much about this book is that it’s very honest; two good friends love each other and work to take care of each other. The story is simple but touching storytelling and charming illustrations make it a winner. Children will learn Yiddish words like keppie (head) and mitzvah (good deed) too! I love that Sophia is Latino and Mrs. Goldman is Jewish but it isn’t dwelled upon; there’s a great message of community and love here. Karas’ sweet mixed media illustrations are full of gorgeous pale pinks, browns and blustery blues and greens. 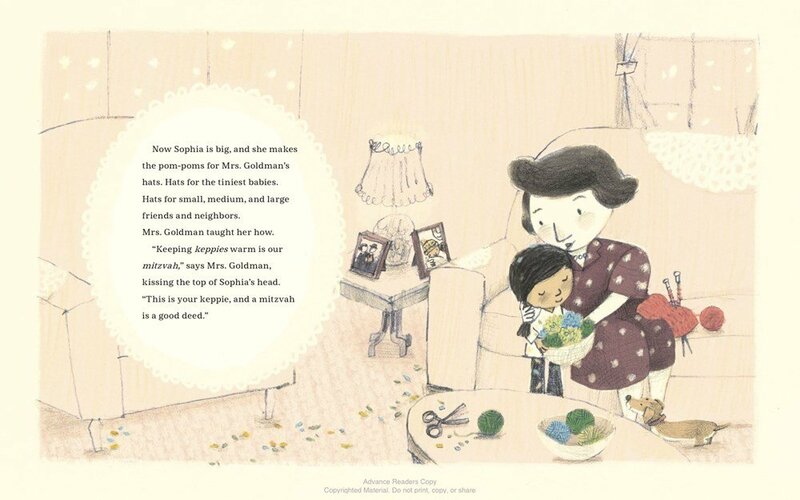 The illustrations are very soft, which adds to the comfortable, homey feel of the story. Sophia, with her determined expressions, brown skin and no-sense side-ponytail is a great character for children to emulate; even though she gets frustrated, she keeps working towards her goal! Edwards even includes a pattern for Sophia’s Hat at the end of the book (Edwards writes for Lion Brand Yarn) so that children can dive into knitting themselves. What a sweet book about friendship and knitting! I hope you’ll enjoy this one as much as I did. We’re about half-way through Native American Heritage Month 2016 and almost a week into a world where Donald J. Trump is the President-Elect of the United States of America…I’ve been reflecting and thinking a lot about peace, love and family. I’ve also been thinking about kindness and doing my best to share books that celebrate open-mindedness, different perspectives, cultures and #ownvoices. I can’t praise this one enough. If you’re looking for a great book that celebrates the joy and wonder of having a child, look no further. We Sang You Home is beautifully written and illustrated. We’re slowly getting more books about Native families created by Native people but we need more. As a bookseller and blogger, I can’t wait for these stories! I want to share them and most importantly, Native kids need to see more of themselves on bookshelves. In We Sang You Home, a Native couple tells their child how they wished and dreamed for him and how his arrival changes their lives. They are better for having him. “We sang you from a wish. We sang you from a prayer. We sang you home and you sang back.” A child holds its parents hopes, dreams and wishes. Van Camp writes beautifully and in the short format of a board book, tells a story of happiness. We’re reminded that a child chooses its family just as much as a family wishes for it; it’s magic. Julie Flett is a great illustrator; I always enjoy reading and reviewing her books! In this one, she depicts the sweetness of Van Camp’s words with warm earth colors, sunsets & moonshine, toothy smiles and brown skin. Flat, blocks of color fill the pages. The simpler the better for board books and this one is simply beautiful. P.S. Check out Debbie Reese’s beautiful review here. I’m not a big fan of music. I know that sounds weird. I mean, I enjoy listening to music. Of course there are songs that take me back; the memories connected to those songs are so vivid. I always dance and move to a good song or beat. I’m just not INTO music. Some people live and breathe it; they always have headphones on and bump it loud in their car. They talk music, they anticipate music, they live music. That’s not me but I appreciate music and I love how happily this book celebrates it. Music Is…has flowing text that begins simply, becomes more lyrical and ends reflectively. Contrasting words like quiet & loud, slow & fast, lo-fi & hi-fi lead to lines like “cymbals that splash and ba-da-ba bass and rat-a-tat-tat drums on a rumbling stage.” Stosuy’s words are great for reading aloud and invite discussion. “How is music happy?” “What is lo-fi?” “What does ‘Music is for everyone’ mean?” are just a few questions that children might ask when reading this book and for that reason, it’s a book for all ages! Music-loving parents will want this book to share with their children. Amy Martin’s illustrations are bold, eye-catching and so diverse. I love how she uses colors that contrast and highlight. Her art shows children that indeed, music is for everyone. Her illustrations match the rhythm of Stosuy’s words and the cover of the book is so bright and inviting! I love that the cover says “the World’s First Computer Programmer” which establishes the fact that Ada Lovelace was and always will be a big deal. We’ve been blessed with quite a few recent picture books (all written and illustrated by women) about Ada Lovelace. I’ve already reviewed Ada Byron Lovelace and The Thinking Machine which is also very good and pairs well with this book. Ada Lovelace grew up in her mother’s world of numbers and manners. She had a strict academic regimen and was expected to stick to it. Luckily, she was rich and grew up during the Industrial Revolution where she was distracted by modern technology. Ada started to invent things with her mathematical and imaginative mind! Unfortunately, she became very seriously ill with the measles but when she recovered years later, she was a teenager and was allowed to bloom in society. She met the inventor Charles Babbage who became a good friend and introduced her to his invention, The Difference Engine, which was like a large calculator. This machine and the design for The Analytical Engine would change her life. Babbage’s Analytical Engine is considered to be the world’s first computer design and Ada worked on the algorithms for the punch cards to be used in the machine. She programmed the machine using Bernoulli numbers! Ada had the imagination and forward thinking to see a world of potential in Babbage’s invention; she saw endless possibility in programming. If there was one thing I’d change about this book, it would be how Ada’s parents’ relationship is described. From what I understand, Lord Byron could be very uncaring and at times abusive to his wife. Reading this book, one would think that Lord Byron was simply “wild” and Anne Isabella Milbanke much too proper, strict and overprotective of Ada. The illustrations in this book are gorgeous. Robinson’s art is detailed, delicate and fanciful. I can’t imagine how many hours she spent painting and cutting paper to create the 3D images. I love how light the watercolors are on the paper and how much depth she achieves by propping up and layering the cut-outs. My favorite spread is of the giant cotton mills with smoke streaming out of them against a blotchy gray sky. So pretty! Ada’s Ideas is a beautiful tribute to Ada Lovelace’s life and will definitely inspire young children to dream high. Whether you dream in words, numbers or paints & scissors, let your mind soar and discover what you’re capable of! Let’s Celebrate Diwali tells the story of Harini and her friends. These four friends are in the same classroom and on Diwali, they share their Diwali stories. Harini is Hindu, Dhimen is Buddhist, Urvi is Jain and Amrit is Sikh. Dressed in traditional outfits, they take turns telling how they celebrate the holiday and readers learn how rich Diwali is. It’s important that their teacher, Ms. Lo, gives her students the ability to share their cultures and religions during circle time. Her classroom is a safe and welcoming space for all religions and cultures which is something children need to see and experience. Harini and Urvi learn that they both light diyas for Diwali but the stories their families tell are different. This book does a great job of highlighting cultural diversity and respect; all the students in the classroom are engaged during circle time and ask great questions. At the end of the story, Anna, who does not celebrate Diwali, wishes for a special Diwali outfit too and Harini lets her wear her dupatta (scarf) and bangles. Harini races home and can’t wait to share the new Diwali stories she learned at school. Maybe readers will be inspired to learn more about the stories featured in this book! I love the addition of a pronunciation guide + definitions of the vocabulary in the text. Anjali Joshi’s cute and relatable story is one that children will connect to and learn a lot from. I enjoyed Tim Palin’s vibrant and happy illustrations. I especially like the design of the cover; the bright, blocky letters mimic the bright lights and exciting fireworks of Diwali. The round faces of the children in the book are warm and inviting. Here is a cute Paper Diya craft from blogger Artsy Craftsy Mom that pairs well with this book. Just like Harani and Urvi, you’ll have diyas in your home this Diwali.